I love the colour your hot pink coat adds to your black and white outfit! It looks so cosy too! 🙂 Great layering. This pink is just too perfect, Shauna! When I saw the sneak peek on IG last week, I instantly loved the hot pink and polka dot combination. I need to check out this coat, it has my name written all over it! And yes to making Monday bold! Hope you guys had a great weekend and Happy Monday! And wear the brightest clothes I shall as you inspire me! Pink and polka dots on you is an instant smile! I LOVE the vibrancy, the fun, the va va va voom GORGEOUS! You look Monday Marvelous and I hope the week is off to the sweetest start! 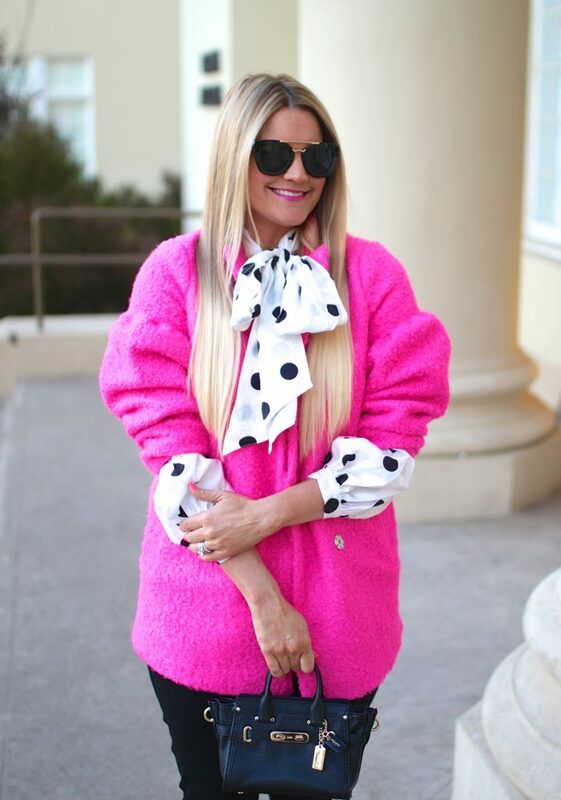 This bright pink coat is fabulous! It looks so good with the big bow on your blouse popping out, too. So Kate Spade! I love that blouse. The coat is also so pretty. That pink is lovely. There is truly nothing more fabulous than this coat!! In love with the color and styled so perfectly with your polka dots! Love the pink! So fun with your polka dots. And I agree about all the tings… because Monday! You look gorgeous! That coat and the polka dots are just so much fun! I like your thinking girl! I also like your outfit. That hot pink is fabulous! I love the outfit! The pink cardigan looks so comfy. Monday’s are always hard! I love your polkadot top, it’s adorable! That coat is amazing! I love the bright pink color! It’s such a perfect combination!! SO vibrant and perfect for Valentine’s Day! So cute! Love the pop of pink! That bow detail is the cutest! Darling look! I LOVE the bright coat.. I need brightness in the winter, and the polka dots are so cute. so fun Shauna! That skirt is absolutely a cutie! Love that you paired it with polka underneath. Really pretty look dear!